PART 6. FUEL LOAD ANALYSIS. PART 7. WERE THE LAWS OF PHYSICS DIFFERENT ON SEPT 11? PART 11. WHAT ABOUT THE EYEWITNESSES? PHYSICAL AND MATHEMATICAL ANALYSIS OF PENTAGON CRASH. Copyright: Gerard Holmgren. October 23 2002.This work may be freely copied and distributed without permission as long as it is not for commercial purposes. Please include the author's name, the web adress where you found it, and the copyright notice. WHERE IS THE WRECKAGE OF AA 77? American Airlines Flight 77, hit the Pentagon. It is not in dispute that something hit the Pentagon wall and damaged it. Neither is it in dispute that AA 77 is missing. But was AA 77 involved in the Pentagon incident? This article presents an analysis of the physical aspects of the incident, and concludes with a brief examination of the issue of eyewitnesses. The Sept 11 crashes are unique and unprecedented events in the history of both the press and aviation. In many cases, light plane crashes involving 2 to 3 people have triggered investigations which continued for years. Considering that the explosion and cremation of planes had never before happened, the lack of reporting and/or official investigation is doubly puzzling. The issue of whether a crash results from sabotage or accident should be irrelevant to the alarming question of why four planes allegedly cremated themselves as a result of low to medium impact crashes. One of the purposes of accident reconstruction in plane crashes is to determine what failed and therefore what is subject to improvement. Normally, the press releases the findings as news in the public interest. Professional analytical information has not been released on the September 11 crashes. If it exists (for insurance purposes, for instance), it has not been released. Why have authorities and the press treated the Sept 11 crashes differently? Who is doing the professional analysis and why does the public not have access to it? Wingspan 124 ft 10 in (hereafter rounded to 125 ft) Length 155 ft 3 in (rounded to 155 ft) Tail height (with landing gear extended ) 44 ft 6 in Fuselage Width 12 ft 4 in (rounded to 12 ft ) Max fuel capacity 11,489 gallons Max range 4449 miles Max take off weight 255,000 lb. The following specifications were not directly available from any source I could find, but I calculated them based on the above figures, after measuring diagrams and photos. Exact accuracy cannot be guaranteed, but they are close and are sufficient for this analysis. Tail height (without landing gear extended) 35 ft Fuselage height (without landing gear extended) 14 ft 6 in (7 ft 3 in above wings, 7 ft 3 in below wings)) Length of each wing 56 ft 3 in Engine diameter. 9 ft. 6 in Engine length 11 ft 6 in Position of engine mounting on wing. Outer edge of engine 25 ft from where wing joins fuselage. Width of each tail fin 15 ft 6 in Total tail fin span 39 ft (fuselage is narrower at this point) An estimated 5 ft of engine is below fuselage level, making the total height of the aircraft without landing gear extended, 40 ft.
Youll find the calculations throughout this article easier to critically analyze, if you write down the above figures before continuing. I have estimated the hole in the Pentagon wall to be about 65 ft wide, by comparing it with the height of the building which is 77 ft. Depth of damage. 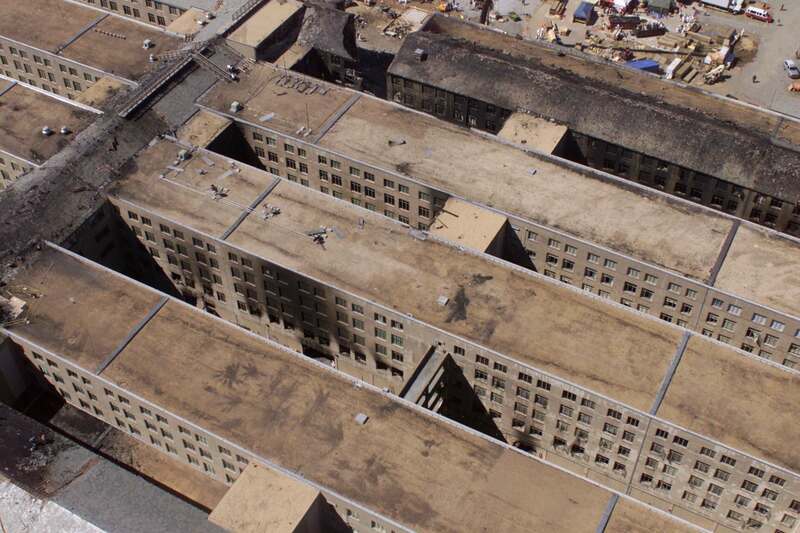 This is more complex.The Pentagon consists of 5 rings of building, each separated by a space between. I couldnt find any source which directly stated figures for the depth of the rings and the spaces, and the perspective problems of photos make it more difficult to estimate than the width. On the basis of aerial photos, ( see the links below ) I have estimated the depth of the ring itself to be about 32 ft, and the open space behind it, about the same. The outer ring collapsed , leaving a total depth of about 65 ft that the plane could potentially have fitted into, considering that the second ring of the building was intact. It should be noted that the original hole was much smaller. The 65 ft wide hole developed when a section of the wall collapsed later. Look at the following photos, taken soon after the crash, before that section of wall collapsed. The thick smoke and the water jets from the firefighters make it difficult to get a clear view, but we can determine that the hole wasnt anywhere near even 40 ft wide. Probably less than 20. In most of the photos, its difficult to find any hole at all. Calculations based on the 65 ft wide and deep (including open space between the rings) hole which developed later, are unreasonably generous to the 757 argument. Nevertheless, I will continue to conduct the analysis on that basis. I am going to attempt to prove that it was physically possible for a Boeing 757 to crash into that section of wall, in a manner consistent with the photographic evidence. If I manage to prove that it was physically possible, that doesnt prove that it happened - it simply keeps the argument alive. If it proves to be impossible, even by expanding the assumed hole to orders of magnitude greater than what it really was, then it didnt happen and the argument is concluded. By what means could a plane with a wingspan of 125 ft and a length of 155 ft fly into a building, leaving a hole 65 ft by 65 ft, leaving no significant wreckage outside? Is it possible to calculate a wing angle at which the plane might have fitted through? If not, where is the wreckage that did not enter the building? The plane cannot have impacted with the wings in a near parallel to the ground position and have had the wings enter the building. If it impacted in this manner, the wings must have broken off before they had a chance to hit the building. 125 ft of wing cannot pass through a wall without leaving a 125 ft hole. In order to suggest that the entire plane passed through the 65 ft hole, we must calculate the angle at which the wings would have to have been tilted. This can be easily done with some graph paper. Draw a baseline, representing 65 ft - the width of the hole. Draw vertical lines at each end, representing 77 ft - the height of the building. Draw a line representing 125 ft - the wingspan, starting it from the bottom left corner, towards the top right corner, at the angle necessary for the wingspan line not to intersect the right hand vertical line. Youll see that it is possible for the plane to pass through the 65 ft wide hole, but not for all of the wingspan to pass within the impact area. A significant portion of one wing has passed above the building, avoiding any impact. This section of wing measures about 25 ft - almost 1/2 a wing. The minimum possible amount of the plane which can have avoided the impact area is a figure something greater than this because the analysis has been biased by a number of factors, beyond credibility in favour of fitting the plane through. 1) assuming the original impact area to be 65 ft wide, when we know that it was significantly smaller. 2) assuming the lower wing tip to be at ground level, which it may not have been. 3) assuming the angle of the fuselage to the wall to be 90 degrees, meaning that the plane travelled straight through, not widening the impact area beyond its own effective horizontal width. For example, if the fuselage struck at a 45 degree angle, with the same degree of wing tilt, it would create an impact hole 97.5 ft wide.You can plot this on graph paper too. If you draw two parallel lines straight up the page, crossing a line drawn horizontally, the width of line they pass across is equal to the distance between the parallel lines. If you draw the lines at a 45 degree angle to the horizontal line, they intersect with an area 1.5 times the distance between them. So as soon as any angle is postulated for the approach of the fuselage, then the wings need to be tilted harder in order to fit into the 65 ft hole, increasing the amount of wing that passed above the impact area. If we postulate the wings to be tilted at a ridiculous angle like 80 degrees, not only does this increase the area of wing thats passed above the impact zone, but also causes the fuselage to be almost at the top of the building, meaning that one of the 15 ft tail fins, now pointing almost straight up, starts to protrude above the impact zone. It doesnt matter how the angle of approach or wing tilt is juggled. Its impossible to fit anything remotely approaching the entire plane into the impact zone. Therefore, this substantial portion of the plane did not hit the building and cannot have been pulverized amid the rubble, and must be accounted for in some other way. To give an idea of how much the unaccounted for section of wing increases if we lessen the degree of bias, here is a different set of assumptions. Original width of hole 40 ft. Lower wing tip 10 ft above the ground. The amount of the wing which would now pass above the impact point would be about 47 ft. And the entire upper tail fin would no longer fit in sideways, because the bottom of the heavily tilted fuselage would be hard up against the right edge of the hole.The wing angle could be tilted more heavily to fit in the tail fin, but this further increases the length of wing passing above the impact zone. This is still assuming a fuselage angle of 90 degrees, and a hole larger than what it really was. So we have to stretch the variables beyond credibility in favour of the 757 theory just to reduce the unaccounted for piece of wing to 25 ft. Since this large portion of wing would not have had any serious impact upon it, there is no reason for it to have been pulverized into nothing, unless there was an explosion powerful enough to cremate the wings right to the extremities. If this did not occur, then this section of wing would have suffered no impact other than that of falling to the ground or on to a roof after it broke off. Its conceivable that it could have broken up into a few smaller pieces, but not to have been pulverized beyond evidence of it ever existing. So there should be evidence of a large piece of wing, or several pieces, large enough to be clearly identifiable, outside the crash site, or possibly sitting on top of the rubble. Most likely, it (they) would have finished up somewhere inside the courtyard or on a roof. The chance of it finishing up on top of the rubble would be small, the chance of being buried under the rubble, negligible, and the chance of being under the rubble and smashed into pieces too small to identify, effectively zero. No evidence exists of any such wreckage, and there is no reason why it should not have been found and presented if it existed. We must therefore conclude that if the 757 theory is to be kept alive, one has to postulate an explosion significant enough to cremate an entire length of wing beyond evidence that it ever existed. Because the only available energy source for such an explosion is the fuel, and an explosion must generate force equally in all directions, this forces us to the conclusion that most of the plane must have been similarly cremated by the explosion.There is also the problem of the tail. Being the last part of the plane to enter the building, the wall should already have been smashed down by the time it entered. So the tail should have suffered less impact than the forward part of the plane, increasing the likelihood of large identifiable pieces being found. That no evidence remains of it also forces us to postulate a massive explosion capable of cremating it. Before examining this question further, I will now do the same style of analysis on the scenario of the plane hitting the wall with the wings approximately parallel to the ground. If this happened, it is clear that the wings never contacted the wall. They certainly did not pass through. The hole is 60 ft too narrow, leaving 30 ft of each wing that cannot have passed through. And there is no evidence of any damage to the sides of the hole that would indicate contact of this type. If the wings did hit the wall, they cant have simply bounced off, without leaving any damage to the wall, while simultaneously cremating themselves from the force of the impact. Especially if the fuselage was apparently able to plough significantly into the building, before being cremated. Not only is the fuselage penetration indicative of the test of strength between the wall and the plane, but the wall would have been weakened by being split open by the fuselage, making it easier for the wings and tail as they followed. So in the event of the wings being parallel, since no wreckage exists to support their existence, we must also postulate an explosion significant enough to cremate the wings to their extremities, in order to account for the two missing 30 ft sections. Regardless of at what angle the wings may have been tilted, it is impossible for all of the wreckage to have been impacted, buried and crushed beyond identification within the rubble of the 65 ft by 65 ft area of wall damage. A significant section of at least one wing, something more than 25 ft long, never entered the impact zone, and cannot have been cremated by impact alone, and yet appears to have vanished. The lack of any other wreckage also indicates cremation. And since explosions generate force equally in all directions, one cant postulate an explosion powerful enough to cremate the extremities of the plane - tail, nose and wing tips without postulating that the entire plane was cremated. Therefore, it is either drop the 757 theory or postulate an explosion powerful enough to cremate the wreckage to the point that no evidence remains of its existence. Before examining in detail the explosion question, lets look at the depth of the hole. 65 ft. The length of the alleged plane was 155 ft. Nothing identifiable remains of any part of the plane. If we were not to postulate an explosion we would have to suggest that the fuselage was compacted to 40% of its original length - at least, just to explain the lack of damage to the second ring. Thats assuming the entire depth of the first ring to have been burst through in the initial impact, and part of the compacted plane to have protruded out into the space between the two rings. But if such compacted wreckage came to rest there, it would be highly visible, and without a subsequent explosion, there is no way to explain where the compacted fuselage went. So the entire length of the plane needs to be compacted into the space of the first ring - about 30 ft - quite impossible. One would have to suggest that the fuselage compacted to about 20 % of its length against the unyielding wall, and then suddenly burst through, coming to rest inside as a 30 ft lump amongst the rubble. Or alternatively, that it was still being compacted even after it burst through, meaning that as the rear of the plane entered, the rubble and the compacted remains of the front of the plane, were still providing significant resistance, like a person trying to hold a door shut against a stronger opponent, and being gradually pushed back. This cant happen. The wall either holds or it doesnt. The plane either penetrates or compacts. It doesnt do both simultaneously. Its possible that there could have been a certain amount of compaction before penetration, but at some point the wall had to give way, and once it did, there would be no more compaction. If its going to give way, it will be early in the process. And yet, postulating a 50 % compaction of 90 % of the plane, before it suddenly burst through - which is quite impossible - would still leave a final fuselage length of 85 ft to be accounted for - also impossible. And this still leaves unsolved the problem of what happened to it afterwards. Theres a severe problem not only with the width of the impact area, but also the depth. Neither the fuselage nor the wings can fit into the allotted space. Postulating an angled entry slightly reduces the amount of compaction required, but not by the orders of magnitude necessary to fundamentally solve the problem. For example, if one was to redo the last calculation on the basis of a 45 degree entry, it would be reduced to a 42% compaction of 90 % of the plane before bursting through, leaving an 85 foot length of wreckage, which lying at a 45 degree angle, would leave about 37 ft of fuselage extending beyond the first ring, almost reaching the second. And there would now be either a wider entry hole, or a greater section of wing which missed the impact zone. .Although debris of some kind exists, there is nothing of enough substance to provide any evidence of what kind of plane it was, and the volume is insufficient to account for anything remotely approaching the dimensions under discussion. This is further proof that in order to keep the 757 theory alive, we must postulate an explosion which cremated the plane. The only available energy source for such an explosion is the fuel load, which means that the explosion must have been centred in the fuselage. An explosion generates force equally in all directions. It had to have cremated both ends of the plane, which means that the minimum force which can be postulated is one sufficient to destroy a tail or nose from 77 ft away. Thats what was required if the explosion occurred in the exact centre of the plane. Shifting it away from the centre means that less force is needed at one end, but more at another. Since the force must be generated equally in all directions, the smallest force we can postulate is one emanating from the centre, if we assume the force needed for cremation to be equal at both ends. Because any discrepancy in relation to that question is not calculable, I will assume that to be the case. If it is incorrect, it wont effect the integrity of the following analysis, because it reveals fundamental problems with the scenario as a whole, which cant be solved by shifting the problem from one part of the plane to another. An equal force must have been generated forward of the centre point, behind it, above it, and below it. (At least potentially so, if not blocked by the ground ) So we must draw a 3D circle around the centre of the plane, and know that every point on the edge of that circle was impacted by a force sufficient to cremate the tail of a plane, and that all points closer to the centre were subject to an even greater force. If the plane blew up as it was entering the building, there are two basic scenarios. 1) The centre of the explosion was inside the building. For example, the plane entered with the wings sharply titled, and exploded after the wings had entered (and passed above ) the impact area. 2) The explosion occurred outside the building, because it happened earlier in the process than in scenario 1). The previous analysis of the depth problem tells us that scenario 1) is impossible. If the plane was half way into the building (77 ft of penetration), then even allowing for 12 ft of compacting, the nose would have been hard up against the second ring when the explosion took place. Theres no sign of such damage to the second ring. Nevertheless, Ill explore the full implications of the inside the building scenario, just to make sure that nothing is left out. Assuming half the plane to be inside the building, and the explosion to be just inside the hole, at this time the tail is still about 77 ft to the front of the wall. Its exposure to the blast is partly shielded by the fact that the explosion is actually inside the collapsing section of the building. The same goes for the nose which is, allowing for compaction, about 60 ft forward of the blast centre, outside the collapsing ring. And yet both were cremated. So we have to increase the alleged power of the blast to account for the shielding of the front and rear extremities. We cant quantify the shielding, and must note that because the wall had been smashed down by this time, the shielding may have been small, but we can say that the force of the explosion was something greater than what was needed to cremate the nose and tail, had the plane been in the open. What would have received the greatest impact from this blast? The centre of the fuselage, and the first ring of the building. The explosion was right inside it. So the building was subject to a force significantly greater than that of the cremated nose and tail. What was the effect on the building of this massive blast ? Nothing, apparently. It had already been split open and weakened by the impact of the plane entering it. It appears to have suffered no extra damage as a result of the explosion. The wall face was negligibly damaged beyond a width of 65 ft - less, when we take into account that the original hole was smaller. Neither was the inside area of the wall, behind the face, significantly damaged width-wise beyond this point. Neither did the force of the explosion have any effect further into the building. The second ring, right next to the cremated nose, closer than the cremated tail, suffered no damage. If the explosion was centred in the middle of the 65 ft hole, just inside the building, then allowing for the width of the fuselage, it means that the wall suffered negligible sideways damage only 26 ft from the edges of the fuselage which was cremated. Speculation that the wall was of an extraordinarily strong construction, apart from suggesting an impossible strength, makes no contribution to explaining these anomalies. If it was so tough, then how did the plane slice its way into it to begin with? Wed have to believe that in the test of strength between the plane and the wall, that the plane penetrated the solid wall, but was then completely obliterated by an explosion which had no effect on the now damaged and weakened building. This isnt possible. Theres a further problem. A number of alleged witnesses claim that small pieces of the plane were scattered over a wide area. One (Mike Walter, whos report I reviewed in a previous article linked later in this article) said he saw debris up on the overpass. Penny Elgas (report reviewed later in this article, said a piece of the plane landed in her car. A number of photos ( examined later) purport to show small fragments of the plane, flung out considerable distances from the scene. But curiously, none of these alleged witnesses or any of the photos describe showers of rubble from the building. Why arent there stone pieces scattered all over the place, if the building was the centrepoint of the explosion? But this is an aside from the main proof. The scenario of the explosion inside the building is impossible on two counts. 1) That an explosion of sufficient power to cremate a 100 ton aircraft, some of it at distances of 77 ft away, could have no impact on an already partly demolished stone building, which was at the centre of the blast. 2)That not enough length of plane could have entered the building, unless one is to suggest that the explosion occurred right at the front of the plane, which then forces one to increase its alleged power by orders of magnitude to cremate the rear, more than 140 ft away, compounding the problems of reason 1. So its impossible for the explosion to have occurred inside the building. 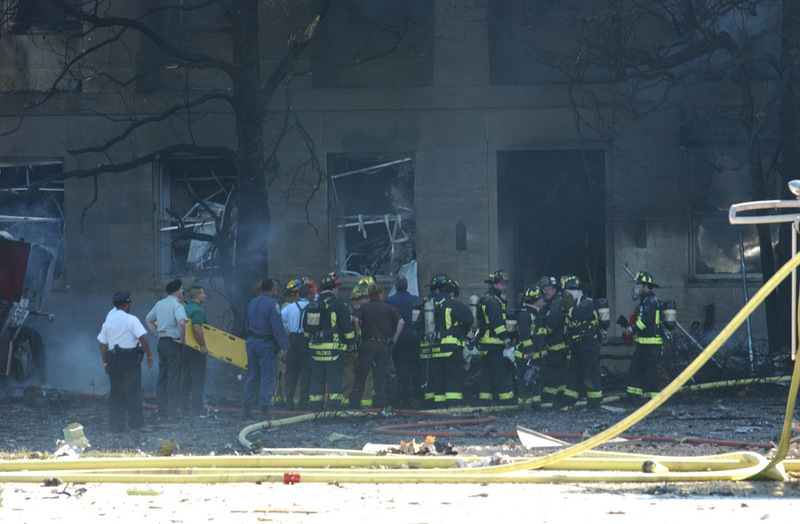 In order to keep the 757 theory alive, we must postulate that the explosion took place outside the building. Then we have the same problem in reverse. Suppose the centre point of the explosion was the centre of the plane. If it took place when the wings were close to the wall, then the wall was still subject to the maximum force. A greater force than that applied to the tail. And the nose is now the part thats shielded, inside the wall. If the 125ft wingspan was parallel and right next to the wall and was cremated, then there should be 125 ft of severe damage along the wall, and an extensive area of gradually declining damage beyond this point. If we tilt the wings at 45 degrees, to reduce the effective horizontal width and effective height of the wingspan to about 90 ft, meaning that no part of the wing was further than 90 ft from the blast, we must still postulate an area of massively destructive force at least 90 ft wide along the wall face, with gradually declining severity of damage further to the sides. There cant have been a sudden cut off point for damage to the wall. It would have been pulverized to nothing at the centre point, gradually reducing in severity, to cosmetic damage such as broken windows, blackening and superficial face damage at a point significantly beyond the wingspan width. Since the wall shows negligible damage beyond 65 ft, the damaged area isnt wide enough to accommodate speculation of the nearby wings being blasted into nothing. Even if the plane went in at the crazy angle of a 90 degree wing tilt, the wing extremities covering a total span of 125 ft, above and below the explosion still have to be cremated, meaning that an equal span of force has to be generated sideways along the wallface. And yet somehow the building escapes with negligible damage beyond a total span of 65 ft. So this didnt happen either. The last hope is to suggest that the explosion took place almost at the instant of impact, before the plane had significantly penetrated the wall. This places the centre of the blast the maximum possible distance from the wall - about 77 ft. It makes no difference to try to compound this by suggesting that the blast was also further towards the back of the plane, because then we have to increase its power, to account for the cremated nose. The wall, at the point where the nose struck, still has to be receiving a force equal to that necessary to destroy the nose. If we draw the 77 ft circle around the middle of the plane, the extremities of the 65 ft hole are only about 8 ft beyond the circle, meaning that this width of wall should still have been subject to massive force, and that we should still be seeing very significant damage beyond this width. At 50 ft either side of the centre of the nose, creating a wallface length of 100 ft, the wall is only about 16 ft from the circle. So although the scenario is not as ridiculous as the previous scenarios, its still impossible to reconcile the narrow area of significant damage to the wall with the enormous forces being inflicted on the nearby plane. When one considers that only 16 ft away, the blast is powerful enough to cremate a plane tail or nose, the impact on the 100 ft section of wall should be dramatic. And this scenario creates another problem. It requires the postulation that there was no significant penetration of the plane into the wall. In this case, then virtually all of the damage we see to the wall, was caused by the explosion, not the impact. In this case, its very difficult to create a plausible scenario for the shape and size of the damage. The force would have been at its greatest in the centre where the nose was obliterated. It would have been gradually less as you look to the sides. So the original damage should have been V shaped, with the centre point of the V, in the middle of the 65 ft hole, and the wide shallow area at the outside wall. No such evidence exists. What we see is a neat rectangular hole. The obvious counter argument is that the original shape of the hole has been masked by the later collapse of one wedge of the wall, and that the early photos are too obscured by smoke and water to tell us exactly how far and in what shape the original damage extended. Quite so, but this admits that most of the damage wasnt even caused by the explosion directly, but simply by the secondary collapse, meaning that the original area of direct damage was tiny. For example, the points on the wall 20 ft each side of the centre, creating a total span of 40 ft, were only 5 ft further away than the tail, which was allegedly cremated. So this area should have been ferociously demolished in the original damage. Early photos show this wasnt the case, and only 15 ft further to each side - points which are only about 9 ft further from the blast than the tail, all we see are broken windows. Some are still intact. The windows you can see just outside the damage area are only about 10 ft further away from the blast centre than the nose or tail would have been. Trying to solve this problem is futile.The fundamental problem is that the modest damage to the wall is not only irreconcilable with the impact of a such a large plane, but also irreconcilable with the explosive forces needed to destroy one. So any scenario of the plane hitting the building at a 90 degree fuselage angle is impossible. The wreckage is not inside the building, is not outside, and the force of a blast powerful enough to cremate the missing wreckage was impossible in the context of the wall damage. The above calculations and analysis were based on the assumption that the fuselage struck the wall at a 90 degree angle. This wasnt because I necessarily believe that whatever hit the wall did so at this angle. It was because it a) favoured the 757 theory to the maximum, by keeping the entry point as narrow as possible, and b) kept the maths simple as an introductory reference point to the problem.The calculations change for every different angle assumed. Its impractical to do a separate analysis for every possible angle, but neither is it necessary. It is sufficient to take a snapshot half way through the range of possibilities. By assuming a fuselage angle of 45 degrees, we gain an insight into the trend of how the problem changes by angling the fuselage. First, the parallel plane scenario. Plotted on graph paper, this shows that at the point that the fuselage strikes the wall, the inner wing tip is only about 18 ft from the wall. If the fuselage continued to drive into the wall at this angle, the wingtip would strike the wall about 65 ft from the near edge of the hole made by the fuselage. If the wing was to slice into the wall, we should see a continuos rip in the wall extending about 65 ft until it joined up with the fuselage hole. Meanwhile, as the fuselage was driving deeper and wider, it would create its own hole moving further away at 45 degrees. If the wall collapsed along the fuselage impact area, then wed see one long hole made by the fuselage. If it punched through cleanly, wed see a 45 degree tunnel, and a separate hole starting 65 ft away from the southern edge, (assuming the plane to have been coming from the south west.) From the size and shape of the damage to the wall, we know that this didnt happen. Lets straighten up the angle of the plane to try place the wingtip strike within the 65 ft hole area. The hope here is that then the entry point of the inner wing might come within the area where it was masked by the later collapse. Im going to try to create a scenario where there might have been one point of entry for the fuselage, and a separate one less than 65 ft away for the wing, creating two holes within a 65 ft area. This would appear to unsupported by early photographic evidence, but we may be able to argue that the thick smoke and the water jets at the time obscured it. But it doesnt work. If we straighten the angle to 67 degrees, it only reduces the distance of the wingtip strike from the near edge of the fuselage strike by a few feet. Once we straighten the angle further, its almost back to the 90 degree scenario, so theres no point in pursuing that further. This is before we introduce the impact of the outer wing, which would slice a big hole to the north of the fuselage area. Even if you ignore the previously examined problem of compaction into the 65 ft depth, then connecting all this up into one hole, creates one of about 140 ft wide before the second wing enters the building. So the scenario of the fuselage having come in on an angle with the wings parallel and penetrating the wall is impossible. Did the wing break off and not damage the wall? If so, we should see big chunks of the wing scattered to the south of the main crash site. No such wreckage exists, so this didnt happen either. What about an explosion? We have the same problems as with the 90 degree scenario, but worse. Even if the explosion occurred the instant of collision, the centre point would be much closer to the southern stretch of the wall, than in the 90 degree scenario, where we were able to place it 77 ft away. A section of wall more than 100 ft long would be closer to the centre of the blast than the tail. And if debris was flung out, much of it would have been hurled into the wall. Theres no significant damage extending for anything like this length along the wall. So the scenario of an angled approach with parallel wings, whether penetrating, breaking off or exploding is impossible. Lets look at a 45 degree approach with tilted wings. Nothing changes as far as the explosion scenario goes, because the distance between the exploding fuselage and the wall hasnt changed. An impact scenario still gives a width way beyond the 65 ft hole. If the plane didnt explode,and fully impacted from a 45 degree angle with the wings tilted at 45 degrees, the total impact area would be about 125 ft wide, perhaps split into three separate areas - inner wing strike, fuselage, and outer wing strike, or perhaps if the sections of wall between the different strike areas collapsed, it would be one long hole. It makes no difference which wing was titled up or down, but whichever one was up would have a significant section pass above the building. Every possible scenario has ben examined. Straight approach, angled approach, parallel wings, tilted wings, trying to fit the plane into the building, and trying to construct a credible scenario for an explosion to explain the lack of wreckage. None of them work. So its impossible for a plane of that size to have caused the incident. These results are in spite of the fact that I biased the equations beyond credibility in favour of the 757 theory. Imagine the results had I assumed an impact hole of 40 ft, which still would have been orders of magnitude greater than the original hole. This really concludes the argument. When a plane hits a building, the wreckage must be accounted for in one way or another - all of it. Either it is inside the building, or it is outside the building, or it is disintegrated to nothing. If none of these three happened, then it was never there. It is acceptable, indeed predictable, for small fragments to be unaccounted for, but not 99.99% of the plane. The plane weighed about 100 tons, so 1 ton of alleged wreckage would represent 1% of the plane. The fragments claimed by some to be wreckage of the plane ( which I will examine later ) would be srtuggling to represent 0.01% of the plane. Nevertheless, I anticipate that some people will still want to argue that 2+2 = 5, and claim the 757 theory to be still alive on other grounds. So I will now suspend the results of the previous analysis,and examine other aspects of the case. 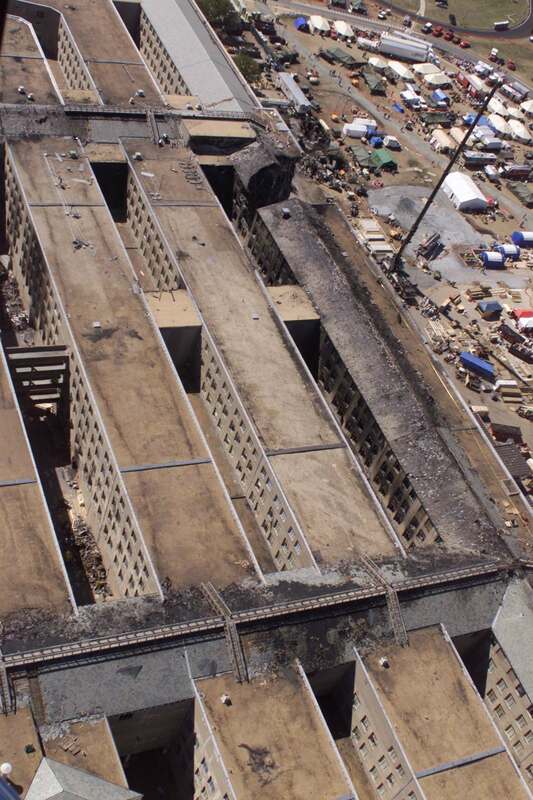 The previous analysis examined the question of whether it was possible for the plane to have been cremated in the context of the damage to the Pentagon wall. It was shown not to be. But is such a cremation possible anyway, in any situation? The only available source of energy is the plane's fuel. Jet fuel burns at 800 degrees C. Aluminium, from which a large part of a plane is constructed, melts at 660 degrees C.
During the aluminium recycling process, it is heated to 700 degrees C, and then poured into moulds. So it is possible in theory for burning jet fuel to melt aluminium, although this is not the same as cremating it. Whether it's possible in practice depends upon the ratio of fuel to aluminium and how efficiently it is applied. One look at the shape of an aircraft tells us that it's a very difficult shape to efficiently apply such energy to. Long and thin one way, crossed at 90 degrees by another section, also long and thin. So if one was to try to melt a 757 by sitting it in a tub of burning jet fuel, the tub would have to be a very specifically designed shape, unless you wanted to waste an awful lot of fuel. No such intelligently designed, controlled and efficient application of fuel can occur in a crash, so even if all of the fuel burned or exploded, only a small proportion of it could have been applied in an efficient manner to the task of melting the plane. How much fuel was on board? A maximum possible figure can be calculated from the specifications referenced at the beginning of the article. According to the official story, the plane left Dulles, flew about 400 miles to Ohio,and then 300 back to Washington before crashing - about 15.7 % of it's maximum range. So if it had a full tank on departure, then the most fuel it can have had when it crashed was about 85 % of it's maximum capacity. This is 9765 gallons. The maximum take off weight of the plane is 255,00 lbs. Let's assume a rounded figure of 200,000 lbs of aluminium and other materials in this plane. I'll call it 180,000 lbs of aluminium. thus increasing the work needing to be done by the burning fuel, a factor which then needs to be offset by such materials as glass and plastic, then assuming the other 40,000 lbs of plane weight to be roughly equivilant to another 20,000 lbs of aluminium in terms of the energy required to melt the plane would appear to give an accurate enough estimation for the analysis which follows. Such crude approximations are only a problem if the result is marginal, so lets see if it is. It means that each gallon of fuel, even applied with intelligent efficiency would have to melt about 18.5 lbs of aluminium. Does this sound possible? Assume a 50 % efficiency rate, which would seem extraordinarily generous. The result is the equivalent of half the available fuel being applied with intelligently designed efficiency, and the other half being completely wasted. So the equivalent ratio for the problem is the need for each gallon of fuel being able to melt 37 lbs of aluminium, in a controlled and designed situation. Let's translate this data into an everyday example. 1 gallon is about the size of the small emergency fuel cans that motorists carry. 1 lb of Aluminium makes about 29 and a half standard soft drink cans. So 37 lbs of aluminium is about 1090 cans. Can you melt 1090 aluminium cans with a 1 gallon can of kerosine? Let's reduce the alleged cremation of AA 77 to a crude model with a scale about 1 to 10,000. This model is extremely crude, but nowhere as crude as simply saying The plane burned - end of thought process. The model doesn't take into account other materials such as glass, plastic, fibreglass, steel, titanium etc. And the scaling is extremely rough. But the only point in exploring this model further would be if it gave any indication that the melting of the aircraft was even remotely possible. Reduce the fuel load to a scale of 1 to 10,000 - about 1 gallon, and then halve it to account for the 50 % efficiency. Reduce the weight of the plane to the same scale - about 18 lbs of aluminium. Reduce total cubic volume of the plane by the same scale, in order to keep the same weight to size ratio- and material to air ratio. This means reducing the dimensions to a scale of about 1 to 22. ( 22 times 22 times 22 = close enough to 10,000 ) The result is a fuselage about 7 ft long, about 6 inches wide and about 7 inches high, with a very thin cross section representing the wings, about 5 ft 6 in long. This structure is made from 18 lbs of aluminum - about 530 compressed aluminium cans. To give an idea of the density, each foot of the fuselage would contain about 70 cans worth of metal. Fill a section in the middle with half a gallon of kerosine and set fire to it, and see if you can melt it. Better still, attach a fuse to a small firecracker placed inside, to give the fuel the best chance of going up in one sudden catastrophic explosion, rather than burning slowly, to see if we can not just melt, but actually cremate the model - reduce it to a pile of dust and ashes. It is of course, impossible. Lets look at the small scale model from a different angle. 1 gallon is about 12 standard soft drink cans. So we need 12 cans worth of kerosine to melt 530 cans. That's about 44 cans to be melted for each full can of kerosine. Expressed another way, take one standard soft drink can, a scew top lid from a cordial botlle, put two lidfuls of kerosine into the can, drop in a match and see if it melts. 1 gallon of kerosine cannot melt 18 lbs of aluminium even in the most efficiently applied, controlled situation one could devise. And we're only talking about melting, not cremation. Even if this ridiculous scenario was possible, we should see a big block of something approaching 100 tons of melted aluminium somewhere. This would be a little hard to miss, if it was there. The US government may be the most powerful on Earth, but if it believes that it has invented legislation that changes or suspends the laws of physics, then it needs a reality check. Things can only happen if there is enough energy to drive the process. All such processes are calculable and predictable. If there was insufficient energy for an alleged event, then it never happened. There wasn't enough energy in the fuel load to melt, let alone cremate the plane, which means that it didn't happen. Once more, the argument is concluded, but for the sake of hard line sceptics, lets move on to another aspect. There are some who like to point to the WTC crashes to make the point that planes can and do explode into nothing in a crash. It is curious that the only examples which can be found of this allegedly explosive cremation of crashing planes just happens to be on Sept 11, 2001. A thorough examination of the history of aviation disasters on any other day shows that this simply doesnt happen. This will be demonstrated by a library of aviation disaster photos to be presented shortly. Unless the laws of physics were different on sept 11 2001, all that the WTC crashes demonstrate is that these planes must have been loaded with explosives, because a tank of kerosine does not have the capability for that kind of explosive force without the input of an extra energy source, nor the total available energy to do the job. Following is a series of photos of planes which crashed into mountains, nosedived into the ground, collided with other aircraft, crashed on take off, crashed into buildings, streets or forests, had bombs planted aboard them, or crashed next to petrol stations. Note the remarkably intact wreckage compared to what happened in the WTC crashes and what is alleged to have happened in to AA 77. Not all of the crashes are entirely comparable in terms of impact and fuel load, but there are enough different situations here to make the point that total cremation of crashing aircraft, without the input of additional energy other than the fuel load does not and cannot happen. Heres a good comparison. An American Airlines Boeing 757 which crashed into a mountain. This plane crashed into a field 80 degrees nose down. This DC 10 crashed into a mountain. This one crashed right next to a petrol station and still didnt blow anything up. And heres a whole lot of other crashes This is what real wreckage of real plane crashes looks like. Wreckage photos of the plane which crashed into the Empire State Building in 1945 are unclear, but here is a description of the wreckage. Here's the wreckage of the cessna which crashed into a building in Tampa in Jan 2002.
have photos of hundreds more crashes which I havent linked to individually. In the first list, they are listed from top to bottom by date. One famous date is conspicuous by its absence. Sept 11, 2001. There were 4 plane crashes that day. But none of them left any wreckage. 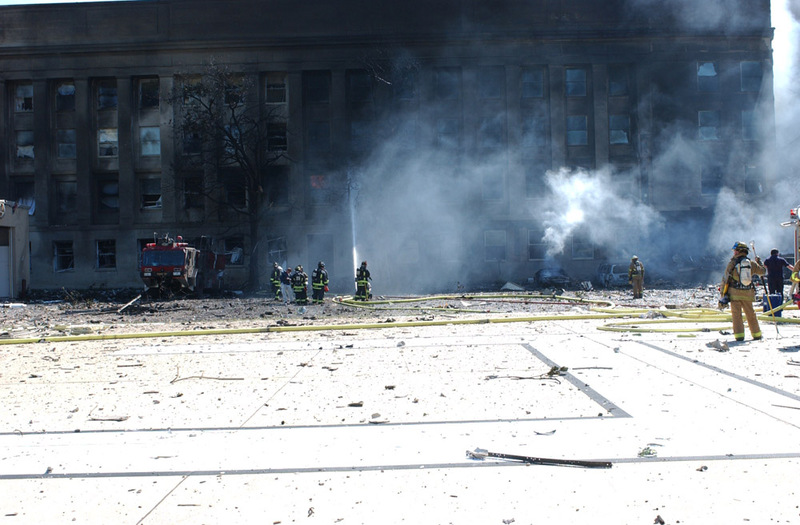 What it means is that the WTC crash planes and whatever hit the Pentagon were destroyed with powerful explosives. Information about UAL 93 has been so scarce that its hard to comment. ( Why the secrecy ? )The preceeding photos demonstrate that the WTC crashes were unique in aviation history. Its already been demonstrated that a full tank of jet fuel doesnt have the available energy to do the job. The analysis below demonstrates from a different perspective why crashed planes do not explode in massively destructive fireballs. Kerosine (jet fuel) is not a volatile enough material. But what would happen, just supposing we could get a fuel tank to blow up? Although jet fuel is not a particularly explosive substance, it is possible to get it to explode in some situations. Because it so rarely happens, we are forced to examine a different kind of air disaster - TWA 800, which blew up in mid air, shortly after take off. The official story is that it was caused by an exploding fuel tank. Sceptics say that it was hit by a missile. Regardless of which it was, there was plenty of wreckage.The following analysis of arguments relating to TWA 800, demonstrate that both sides of the argument act to debunk the official story of AA 77. If it was hit by a missile, then it demonstrates that even an impact of this ferocity still doesnt reduce a plane to dust and ashes, and doesnt set off a catastrophic fuel tank inferno capable of cremating a plane. If the official story is true, then the arguments put forward to support it (several years before AA 77) act as inadvertent rebuttals to the official AA 77 story. he discusses a theory put forward by Stanford University Professor Sullivan S. Marsden about why TWA 800 exploded. Professor Sullivan has had to propose a very complex set of circumstances to try to explain how such a unique event as the alleged explosion of a fuel tank could have occurred. In other words, its impossible to blow up a full tank of fuel, without input of extra energy, because the air /fuel mixture isnt right, and the presence of the full fuel load cools it to below explosive temperature. Even a full fuel tank falls ridiculously short of the energy required to even melt a plane, let alone cremate it, and this theory is saying that the only real risk of an explosion is with a near empty tank. Which is why TWA didnt get blown into nothing . And why it simply cant happen, even when planes have bombs planted aboard or are shot down. Sceptics claim that even Marsdens theory is ludicrously overestimating the explosive capabilities of jet fuel. From this Washington post article. enough to explode and that only a blast outside the plane could have set off the chain of events. 5 years later, with the occurrence of the Sept 11 crashes, the allegedly explosive nature of jet fuel has been further ramped up to the power of dynamite. Of course ,the article also cites opinions rebutting Donaldsons remarks, but it reinforces the point that a glib statement that AA 77 blew up and disintegrated to nothing - perfectly normal, end of story, whats the all argument about?  is not credible. The controversy over TWA 800 continues, shedding more light on how ridiculous is the claim that it was a full fuel load which blew AA 77 into nothing. In this extract, a supporter of the official TWA 800 story suggests that a full fuel tank is safer than an empty one. So theyre arguing about whether an exploding fuel tank can even break a plane in two, not whether it can reduce it to dust and ashes. According to their theories, it cant explode if its full (it still wouldnt have enough energy anyway) and if its empty enough to explode, its arguable whether it could break a plane in two. Chrisotpher Ronay is equally troubled. As head of the FBI bomb unit for seven years, he investigated 30 aircraft bombings before retiring in 1994. And yet, this explosion, of a violence unprecedented in aviation history still left lots of wreckage. [[The specific fuel involved is called Jet A, a derivative of kerosene and a sluggish explosive. To explode, it must mix with air, an indication that one or more of the eight fuel cells in the jumbo jet's wings were breached--either by violent engine or mechanical failure, by a well- placed bomb or possibly by a missile. There have been cases of sudden mechanical failure that caused fire and the loss of aircraft. An Air Force C-141 transport plane crashed in Europe in the late 1970s when an engine exploded; spraying hot fragments that ignited paint in a cargo hold. A Boeing 767 ripped to pieces over Thailand in 1991 when a computer error caused one engine to deploy its reverse thruster, sending the plane into a vicious spin. But in neither case was there a cataclysmic explosion. Before TWA 800 went down last week, there had never been an explosion of such ferocity aboard a 747-100, a 'wet-wing,' or plane that carries all its fuel in wing tanks. "You have to have instant ignition into a large fuel source," said Mr. Barr, who trains accident investigators. "The way those fuel tanks are sealed, it just doesn't happen." Few bombings of commercial aircraft have ended in such a fiery conclusion. In many cases, jetliners have survived even severe damage from explosions and landed safely. In 1986, terrorists planted a sheet of plastic explosive the size of a business letter under one seat on a TWA flight from Rome to Athens. The explosion killed one man, blowing his seat out of the plane. A grandmother, daughter and grandchild were sucked out of the resulting hole. But the plane survived. In the 1988 crash of Pan Am 103 at Lockerbie, Scotland, there was no fiery explosion- until fuel-laden parts of the plane hit the ground. This mentions a fiery explosion at the Lockerbie site, when fuel laden parts hit the ground. Im not saying that no explosion can occur. What Im saying is that its not easily triggered, and doesnt have enough energy to cremate a plane. 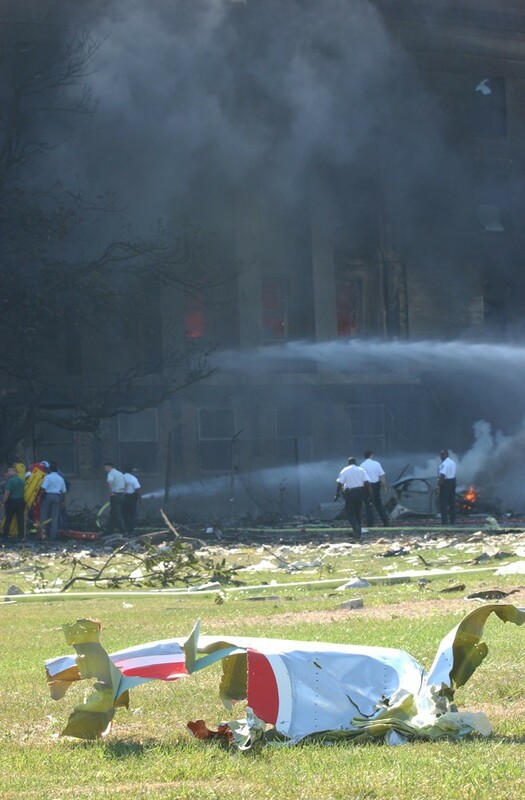 In the case of the Lockerbie bombing, the bomb itself was not enough to trigger an explosion of the fuel tank. Since the plane broke up into five sections, the impact of the exploding fuel upon the full wreckage could not be tested. Heres one section of the wreckage. So if a bomb, breaking a plane into 5 pieces, still doesnt trigger a sudden explosion of the fuel tank, then what does? Crashing into something solid, like a mountain or a building - but apparently only on sept 11, 2001.Theres no evidence that an explosion of the type and power alleged to have cremated AA 77 or the WTC planes has ever happened to any other plane, or ever could in the situation of a normal crash. Although the political circumstance behind the Sept 11 crashes, and (in the case of WTC crash 2 ) the spectacular imagery involved was unprecedented, there was nothing unusual in the impact physics of the crashes. Planes regularly crash into mountains, streets, the ground, buildings and other planes, and are not cremated. In all of these cases significant wreckage - at least - survived. In some cases, the whole plane. So many are saying that even the alleged explosion of jet fuel aboard TWA 800, which left plenty of identifiable wreckage, was impossible. If the official story on TWA 800 is a cover up, then the fuel tank never exploded, and the whole matter of an allegedly exploding fuel tank even breaking a plane in two is an outrageous lie. If the official story is correct, or at least genuinely plausible, then fuel tank explosions are only a risk with near empty tanks, and dont have anything like the necessary energy to disintegrate a plane. And photographic records of aviation disasters demonstrate that fuel tank explosions dont happen as a result of regular crashes, or if they do they dont cremate the planes. In the entire history of aviation, only four passenger jets have ever exploded into nothing, or are alleged to have done so as a result of a crash. All four just happen to have been the Sept 11 planes. And in the case of the WTC, the impact surface was mostly glass - about as soft a target as a plane can hit, with the possible exception of water. So this debunks any assertion that the alleged explosion of AA 77 was a result of being flown into a fiercely resistant surface, which itself is already debunked by examples of planes which flew into mountains and werent cremated, including the earlier linked photo of an American Airlines 757 which crashed into a mountain. Thats about as conclusive a comparison as one can get. The only possible conclusion is that the WTC planes had powerful explosives aboard, and that whatever hit the Pentagon was a much smaller object, also destroyed by explosives. Not only was the alleged explosion of AA 77 impossible in the context of the modest damage to the Pentagon wall , and impossible because there wasnt enough energy in the fuel - its also been shown anecdotally to be impossible in the context of aviation history. Nevertheless, Im once again going to suspend these findings, to examine another aspect. So lets have a look at the photos of the alleged wreckage. Additional to the fact that this represents less than 0.1 % of the volume of the alleged plane, what evidence is there that any of this was once part of a Boeing 757 ? It could be from anything. We know that something hit the Pentagon, that there was an explosion, and that where there is an explosion there will be debris of some sort. To argue that this provides any evidence for either side of the argument is witchcraft trial logic.  You must be a witch, because you wouldnt have been accused if you werent . Supporters of the 757 theory claim this fragment to be wreckage from AA 77, citing the AA colours as proof. In fact, it is the alleged AA colours which prove conclusively that this cannot possibly be part of the alleged plane. Has American Airlines invented a new kind of indestructible paint? This fragment has allegedly been violently flung out from an explosion which reduced a giant airliner to the dust and ashes and unidentifiable tiny fragments shown in the above photo. And yet the paint is as shiny and new as the day it was applied. Does it take more energy to peel and blacken paint, than to destroy 100 tons of aircraft? Clearly painted sections survive most crashes, as shown in the crash photos. But in those cases, no one is alleging an explosion catastrophic enough to vaporize 100 tons of plane. They break up and perhaps burn a bit. In really fierce crashes, some of the plane may actually be destroyed, but even in these cases, tons of reasonaly intact wreckage remains. So these scenarios are consistent with the recovery of painted sections, even in bad crashes. The allegation that this brightly painted fragment survived is irreconcilable with the claim that 99.99% of the plane was vapourized. This is about as believable as the stories that the alleged hijackers were identified by the discovery of their miraculously unscathed passports at crash sites which cremated the planes and occupants. The metal is also shiny and new looking, and there is no sign of grass singeing from the heat in the area where it landed. It is quite impossible for this to be from an aircraft which had just been reduced to a pile of ashes. I anticipate an accusation of inconsistency here. Not so. The photos shown earlier were examples of identifiable and credible wreckage. Theres a further problem with this piece of wreckage. The colours are wrong anyway. Take a close look at the colour scheme used by American Airlines. First, note that the alleged wreckage has a white stripe next to red which is of a larger area than the white stripe. Note the absence of any blue stripe.Now lets look at some actual AA plane photos and youll see that that this colour scheme isnt used. Except possibly in the American Airlines lettering on the top front part of the fuselage, a point Ill come back to. This link will take you to a page with thumbnail photos of American Airlines planes. I chose not to supply the direct links to the enlarged thumbnails, because the URLs were extraordinarily long,and faced a significant risk of breaking once published on the web. Note that the striped colour scheme which the crude fake has attempted to copy does not appear on the wings or tail fins. The reason I make this point, is that this rules out the possibility that this piece of the plane was sheared off during the approach, before the explosion, by hitting a lightpole. If theres any possibility that its a genuine AA colour scheme, it can only have come from part of the American Airlines lettering, on the top and front part of the fuselage, which means that this piece could not have been sheared off on the way in, and therefore must have been subject to the explosion. And that is impossible, even if we were to pretend that such an explosion was generally possible. Furthermore the only part of the plane which it could possibly have come from is towards the front. If the explosion occurred in the middle of the plane, debris from the front area would have been flung forwards into the building not away from it. And if the explosion occurred in the front part of the plane, making it possible to blow this piece backwards, then this area of the plane would have been subject to the most powerful part of the blast, so if we were going to see surviving pieces of debris flung backwards, (especially with paintwork still intact ) they should be from the rear of the plane. And if its alleged that it was thrown forward with such force that it hit something else and bounced back all this distance, wouldnt the paintwork, be just a little scratched? Whoever designed and planted this fake, didnt think it through. Authorities would have us believe that 63 of the 64 people aboard AA 77 were identified from DNA testing. explains why DNA testing is not able to identify all of the WTC victims. Because DNA is destroyed by high temperatures. Read any article or technical paper on DNA storage and sampling, and it will mention the critical role of correct temperature in maintaining the integrity of the samples. And theyre not talking about temperatures above 600 degrees C as being destructive, but temperatures below 150. It needed a minimum temperature of 660 to melt the plane. Actually, a lot more because it would have to have been 660 minimum at the extremities, so it would have been much higher in most of the centre fuselage where the people were. The temperatures required to cremate it are almost unimaginable. And yet we are supposed to believe both stories, that nothing remains of the plane, but 63 of 64 victims still had their DNA intact, while at the same time the heat generated in the WTC is a serious obstacle to DNA testing. We were told that even many victims of the Bali bombing in Oct 2002 might never be identified. [[ Some Australians killed in the Bali terrorist attack are so badly mutilated they might never be identified...The equipment included medical supplies, DNA testing facilities and refrigerated containers to ease the crisis at Denpasar's vastly overworked makeshift morgue. But officials admitted today the carnage was so horrific that technology would make no difference in some cases. "It's highly likely that some victims will be unable to be identified," said Australia's consul-general in Bali, Ross Tysoe. Foreign Minister Alexander Downer, visiting the scene for the first time, said: "Many of them are burnt beyond recognition." And yet we are supposed to believe that those at the centre of a blast which vapourized a 100 ton aircraft left DNA which tested 98.4% successful. To analogize this its worth going back to the 1 to 10,000 scale model. Its like suggesting that before you set fire to it, you placed inside 64 small pieces of plant or animal material. After the catastrophic explosion of the 1/2 gallon of kerosine successfully reduced the 18 lb aluminium model to dust and ashes, 63 of the 64 pieces of material inside, were still able to be successfully DNA tested. This photo shows a hole punched through the Pentagon wall at the back of the damaged area. Lets find its exact location. In the next photo, scroll to the bottom and look approximately in the middle of the photo, at the back of the third ring, below the second set of windows to the right of the bridge between the rings, casting a large shadow Youll see the top half of a circular hole. Heres the same scene from a different angle.You can now see all of the hole . It appears to be at angle of something like 45 degrees from the first ring damage area. How much stone has been penetrated to make this hole? Assuming no internal walls, 6 walls. If each wall is 3 feet thick, thats 18 ft of stone, plus or minus any inaccuracy of the guess of the thickness of the walls, perhaps plus anything that was in the way, inside the buildings. Because its at a 45 degree angle, whatever has made it has actually had to punch out 27 ft of stone. An explosion that digs tunnels? Not even the hard line 757 enthusiasts are suggesting that this was caused by the impossible explosion. The logical explanation is a missile. The 757 supporters claim that it was punched through the wall by one of the planes engines. The engines are mounted on the wings. The wings were allegedly cremated. How did the engine not only escape disintegration, but propel itself forward two to three rings beyond where any of the rest of the plane got to? (Three rings beyond refers to some scenarios that the plane never actually penetrated the building but crashed just outside). There are only two available energy sources for any part of the plane to move through the wall. The momentum of the plane,and the alleged force of the explosion. If the energy source was the latter, why did it propel one small part of the plane forward, while destroying the rest of it? And if the energy source was the momentum of the plane, why hasnt the 100 ton fuselage burst through the rings, instead of the 6 ton engine? Im going to try to construct the best argument I can that this was caused by an engine. The engine became disconnected from the wing before the plane blew up. Otherwise the engine would have blown up too. The engine must have been jolted free of the wing and propelled forward by its existing motion at the same time as something else stopped the rest of the plane in its tracks. By the time the explosion happened, the engine was out of range of the destructive blast, and already punching its way through the wall. Why did the engine burst free? As the plane was approaching the building, the wing hit a light pole weakening the mountings around the engine so that it was hanging by a thread. As the nose slammed into the wall, or perhaps the plane hit the ground just in front of the wall, the resultant change of momentum stopped the plane very quickly, jolting the engine free. It fired into the wall, bursting through as the plane blew up. Thats the best I can do, but there are huge problems. Its a little difficult to imagine that the mountings attatching an engine of this weight could be so critically weakened by hitting a pole, but never mind - ignoring reality has become a regular necessity for any attempt to keep the 757 theory alive. Lets press on. If we speculate that the nose of the 100 ton plane hit the wall,and stopped dead, hardly penetrating, then we cant seriously suggest that an engine, 6% of the weight, now travelling at a lesser speed than what the plane would have been doing when it hit the wall, could punch its way through three rings. If the plane hit the ground, and stopped dead, a few feet from the wall, and then blew up, where is the 155ft fuselage crater,and the sideways damage from the wings? Thats without the explosion. Where is the circle of devastation which should be a radius of something more than 77 ft? This photo demonstrates that this didnt happen. If the engine didnt detach until after the explosion then it cant have outrun the blast. Everything would have been blown up together. If the engine detached from the shock of impact, as the nose hit the wall, and then flew towards the wall, the nose had no reason to stop penetrating the wall until the explosion blew it up. This means that the nose was always further forward than the engine, so if the nose is blown up, so is the engine. If we postulate an angle for the plane and a position for the nose, to try to create a scenario that the engine shoots wide of the blast area, then its also shooting wide of the impact area. Youd have to produce evidence of a second entry point. Whichever engine it was, it has to pass through the 65 ft hole area, and in any scenario where the nose penetrates the wall, its going to pass through later than the nose. And since they must both be travelling into the building at the same angle, then the distance between them will never widen as a result of angle. So unless you want to suggest that the engine actually fired from the wing before the impact ( like a missile ), then any scenario which has the nose penetrating the wall is impossible. In case someone suggests that the engine fired off immediately upon hitting a light pole, Ill point out that theyre built to withstand that kind of contact, and even if they werent, that would knock the engine backwards, not shoot it ahead of the plane. In fact, whatever the cause of its detachment, if it came off when the plane was still moving, its impossible for it to have been fired off faster than what the plane was moving, so if anything happened beforehand, it would have fallen off, not shot forward like a missile. If the scenario involving the nose hitting the wall is impossible, and the scenario of the nose not hitting the wall is also impossible, then it didnt happen. So it was a missile. But lets pretend that the previous analysis doesnt exist and look at other aspects of this question, pretending that the engine theory is still alive. Lets pretend that it was possible for the plane to stop short of the wall and blow up outside, ignoring the lack of damage to the lawns, and say that the engine was jolted free by the previously speculated method, and managed to outrun the blast, before the plane blew up. The engine would have about 60 ft to travel to strike the wall, allowing for the plane stopping 5 ft short of the wall. (90 degree fuselage angle) Angling the fuselage at 45 degrees to make the engines flight path compatible with the direction of the third ring hole, makes negligible difference to the distance from engine to wall, as long we postulate that it was the inner wing engine. If it was the outer wing, it has to travel about 120 ft to strike the wall. Also, the effective horizontal width created to the north (assuming the plane to have approached from the south) by the outer engine angle, means that the front of the fuselage has to be placed hard against the right edge of the 65 ft hole, to fit the engine's entry point into the damaged area. This is significant, because we are now postulating a scenario where the wall suffered no impact other than the engine strike and the explosion. Its impossible to make a credible case for the fuselage cremation happening hard up against the edge of the hole, when just a few feet away windows were unbroken. So we need to assume that it was the inner engine. This enables the nose to be placed close to the centre of the area of 65 ft damage, while still allowing the engine to fire through the damaged area, avoiding the problem of having to suggest a non-existent second entry point. 65 ft hole, in front of where the nose is blowing up - the part of the wall that would be subject to the most force. It might need another 50 ms of burrowing. So to keep the engine safe from the blast, we have to postulate a delay of 250 to 300 ms after the plane crashed, before it blew up. Instinctively, this seems impossible, although I cant produce hard data to prove it. But the scenario as a whole is impossible. This is what had to happen. The plane cant have hit with the nose pointing sharply down into the ground, because then the engine would have been fired into the ground. So it had to land just about level, but stop dead - like a sudden 90 degree belly flop straight out of a momentum of 400 mph. Then we have to postulate a 250 to 300 ms delay, before it suddenly blows up with a ferocity never before seen in aviation history. During this delay, we have to postulate that it didnt break up significantly, otherwise other wreckage would have gone flying off and also escaped the blast. Then it suddenly cremated itself, and did all this without damaging the lawns that it belly flopped on to. Impossible. Postulating tilted wings to try to change distances and angles only makes it worse. If the wings were tilted at 45 degrees, then the lowest point of the upper engine is about 55 ft off the ground, and the the lowest point of the lower engine is about 20 ft off the ground. Since the hole is at ground level, youd have to describe a precise downwards angle for the nose to get the engine to finish up at ground level after its penetration through the rings. But the bigger problem here is that the nose cant have hit the ground with the wings tilted, because the lower wing would have broken off first. This makes it rather difficult to suggest the sudden stop necessary to fire off the upper engine wing with any speed. When is the sudden jolt ? When the wing breaks off, or when the nose hits? We probably have to speculate a halved speed for the engine now - if it could still happen at all - meaning that the delay before the explosion is now 500 - 600 ms, which is getting quite ridiculous, and the engine is now lacking the power it needs to have any chance of charging through 27 ft of stone, which is now a bit more, because its being fired from a raised angle. So if you want the wings tilted, you have suggest that the nose was hitting the wall, which takes us back to the same problems that first led us to suggest that it must have hit the ground instead. And its even worse now. With the wings tilted at 45 degrees, the nose would be hitting the wall at a height of about 40 ft, meaning that we have to suggest that it simply bounced off, or stuck in the wall and hung there (while the engine powered through the wall) or if the nose burst through the wall, were back to the same old problems. So the whole engine theory is impossible all round, which ever way you look at it. Nevertheless, lets pretend its still alive and press on. Theres the question of whether the momentum and weight of the engine was enough to power its way through 3 rings of the building. Lets do some comparisons with weapons specifically made to penetrate strong buildings. about the same as the "Tall Boy." However the "Tall Boy" was travelling at several times the speed, and also contained explosives. And yet, somehow, it appears to be only marginally more effective, perhaps even less. All that engineering for nothing! If the penetrative performance of the 757 engine is anything to go on, it seems that the Brits would been better off to save their money and just drop big lumps of scrap metal. Not learning this lesson, they went on to develop the heaviest bomb of WW 2 , the 22,000 lb Grand slam bomb which could penetrate steel reinforced concrete to a depth of about 12 ft. In addition to its enormous weight and explosive power, it was dropped from Lancaster bombers, giving it great speed by the time of impact. The article mentions that the bombs were exceeding the speed of sound (760 mph), by the time they hit, but doesnt mention by how much. That could be calculated if you knew the height at which the Bombers were flying. Considering that the engine did not have an explosive inside it, was travelling (optimistically) at 300 mph and weighed about half of the Grand Slam, its a little difficult to work out how it was able to a penetration job which would appear to be about equal to that which the Grand Slam was capable of, and do it easily by the look of the photo. Even more remarkable is the fact that the face of the engine is the worst shape possible for penetrating a target. Tens of thousands of years ago, people worked out that pointed surfaces penetrate targets more easily than flat surfaces, and arrows, spears swords, bullets and missiles are designed according to this principle. The above articles mention that the grand slam was aerodynamically designed to ensure that the pointed end would be facing down when it struck. So the engine was really just like a heavier and more powerful version of the old mediaeval catapult. They had less powerful propulsion and couldnt throw anything approaching that weight, but if theyd had even 10% of the alleged penetrative power of this remarkable engine, then most castles would have been demolished within the first hour of the siege. In Dec 2001 it was reported that the US airforces new cave and bunker busting bombs could penetrate 11 ft of reinforced concrete, perhaps more. What a remarkable achievement! Decades of experience and research in the area of missile development, swallowing billions of dollars, have finally achieved a penetrative power approaching that of a flat ended, non explosive, 6 ton chunk of metal hurled through the air at a few hundred mph, like a bigger version of an ancient siege engine. Where is this engine? Did it miraculously disintegrate after punching its way through three rings? Or have authorities rushed it away somewhere to hide any evidence for their own story? In summary, any scenario which postulates the nose entering the wall to any significant degree is impossible, because the engine cant have penetrated the wall more effectively than the nose, and would have been blown up along with the rest of the plane. Any scenario which has the nose bouncing off the wall is impossible, because then the engine couldnt have penetrated, and it also creates the problem of why theres no sign of the impact and explosion 110 ft out into the lawns. (Allowing for a 45 degree fuselage angle) Any scenario which postulates that the plane never contacted the building is impossible for the same reason, and also that the engine probably wouldnt have had time to get to the wall before the explosion, unless we invoke the impossible combination of the belly flop and the long delay. The suggestion that the engine had enough penetrative power to create that hole is attributing to it powers equal to state of the art missile technology, and of the heaviest high explosive bombs of WW 2. Even if it could have penetrated, where did it finish up, and why has it vanished? So it was a missile. Once more, the argument is concluded, but I will again suspend the findings to examine another aspect. When an eyewitness claims to have seen something which is physically impossible they are generally assumed to be either mistaken or lying. Indeed, such dismissal is not limited to reports of the physically impossible, but extended to the dubious. For example reports of UFOs, sea monsters, ghosts or Bigfoot are usually dismissed as hoaxes or illusions, even though such things are not necessarily physically impossible, but simply outside the scope of what we generally accept as being reasonable and credible. The plausibility of such alleged accounts cannot be be mathematically tested, and quantitatively defined as being either possible or impossible. Much of the official story concerning AA 77 can, and has now been, subjected to mathematical analysis, and has been found to be impossible. To uncritically accept eyewitness reports of a solid object fitting through a hole smaller than itself, or alternatively blowing itself into nothing against the rules of physics is inconsistent with the standards of proof and credibility normally applied to alleged eyewitnesses of other dubious, but not necessarily impossible phenomena. The question has to be asked - how many eyewitness reports would be needed to even reopen such a question, let alone consider it to be proved, contrary to the laws of physics? And what standards of verification should be applied? Does an anonymous, third hand, one line quote in a military newspaper (hardly an independent source, considering the nature of the debate ) constitute an eyewitness in these circumstances? How many of these would be needed in order to confidently override the laws of physics ? We need dozens, maybe hundreds of credible well verified, comprehensive eyewitness reports in close to full agreement with each other, from sources which are at least in theory independent, to even reopen the question. The mainstream media and certain web authors have done a smoke and mirrors job to have us believe that such eyewitness evidence exists. Did AA 77 hit the Pentagon? Eyewitness accounts examined. It demonstrated that eyewitness accounts do not confirm a large passenger jet hitting the Pentagon. The findings of the article did not demonstrate that the eyewitness reports, when taken in isolation, prove that it didnt happen. It simply demonstrated that they dont confirm anything one way or the other. They are confused, lacking in substance, highly contradictory and poorly verified. Some described a large passenger jet, some even specifying an AA 757. One alleged witness (Ford) described it as a propeller plane. Many gave no indication at all as to what kind of plane it was, but were unjustifiably seized upon by supporters of the 757 theory as proof that a large passenger jet hit the building, simply because a witness allegedly said that a plane  hit the building. Many claimed to see a large plane close to the scene, but didnt see it hit the building. Another report, which I decided not to review, and in retrospect should have (Steve Patterson) described it as an 8 to 12 seater jet. And even amongst those who claimed it to be a large plane, there was wild contradiction in how it hit. One expects some variation, but not to this extent. One alleged witness, (MikeWalter) said in one interview that it that dove steeply into the building from almost directly above it. But in a different interview he described it as like a cruise missile with wings - the above description wouldnt seem to be describing missile -like behavior- and in several other interviews he said he that he didnt see it at all, including one given only an hour after the steep dive interview. Nevertheless, one media commentator in defending the official story, selectively quoted Walter and wrote Mike Walter is in no doubt about what he saw. Others said it flew level and crashed on the ground in front of the building, near the helipad, and others said it flew straight into the wall. And bear in mind that the meaning of "it" was in many cases unspecified. The verification of most reports was extremely poor, amounting to hearsay. I was only able to find two witnesses who gave direct live interviews for which transcripts were available. Walter and Timmerman. Walter, who gave several interviews, contradicted himself so much that it was hard to know what to make of it. Timmerman's account was impossible to believe, because it required us to believe that a block of apartments suddenly sprang out of the ground half way through his sighting and then disappeared again afterwards. The different accounts contradict each other so heavily, that one has to either dismiss nearly all of them in favour of a few, selected as being the most credible, or else speculate that 4 or 5 planes must have hit the building. It was difficult to find more than any 3 witnesses who agreed with each other enough to group them together. And that was before deconstructing them individually, to test their verification and plausibility. In that article I refrained from comparing the eyewitness reports with any physical evidence. I simply wanted to isolate the reports and see how they stood up in a self contained analysis. But its now time to subject some of these to critical examination of how they fit with the physical evidence. There were two reports (Timmerman and Washington) which explicitly stated a large plane, (in Timmermans case, explicitly an AA 757) and suggested that it crashed on the ground, near the helipad, just in front of the building. Both of these reports were discredited and exposed as almost certain fabrications because of internal inconsistencies, without the need to resort to any of the physical evidence. But lets pretend that their reports had stood up, when viewed in isolation. Here again is that photo of the area in question, surrounded by smooth lawns, just after the incident. Can you pick the spot where a 155 ft fuselage, 12 ft wide, with a wingspan of 125 ft crashed and exploded with a ferocity never previously seen in aviation history ? If this actually happened, then we are wasting money and space building airport runways. We could just use golf courses. The lawns would clearly stand up very well to this kind of treatment. Imagine that you are a lawyer, conducting a defence in a murder trial. Suppose that the prosecution presented Timmerman and Washington as witnesses in relation to the above photograph, which was deemed to be relevant to the case. How would you feel if your client was convicted on the basis that the testimonies of Timmerman and Washington were deemed to override the physical evidence shown in the photo ? Just a chance you might appeal ? Although the eyewitness investigation didnt reveal evidence for any specific scenario, its really significant finding was that it exposed several examples of blatant fabrication of reports which claimed to support the official story. Why fabricate eyewitness evidence for something that really happened? These reports are still circulating around the web and the media as if they were genuine. For example, the report attributed to Captain Lincoln Liebner was exposed as an unequivocal fabrication, but some web authors who I know are well aware of this, and others who may not be aware of it, continue to post the Liebner report on their websites as evidence for the official story. Other reports exposed as certain or almost certain fabrications include Timmerman, Washington, Mcgraw and Winslow. These continue to be heavily promoted as evidence. Of course, the article wasnt perfect, and in retrospect theres a few things I should have handled a little differently. Nevertheless, it was a very thorough investigation, and remains, as far as I am aware, the only comprehensive investigation which has been done into the eyewitness aspect. The best complaint that most critics could come up with is that I didnt go even further, and personally track down and phone the alleged witnesses myself - rather difficult since most of them were either anonymous, or appeared not to exist, or worked for the military, or were simply untraceable without spending amounts of time and money which very few people have. But the same critics had been perfectly happy to accept these bogus or dubious or poorly verified reports at face value and post them as evidence on their websites for months without any attempt at critical investigation. As soon as my investigation was published, discrediting or throwing serious doubt on many of these reports, it suddenly became dreadfully important ( but apparently only for me ) to phone the witnesses, before drawing any conclusions. Meanwhile, these critics happily continue to quote the discredited accounts such as Liebner, Timmerman, Winslow, Mcgraw and Washington without bothering to have done any investigation themselves. The argument seemed to be that because my investigation had only been 95% thorough, then its findings were less credible than those who had done no investigation at all, but simply collected quotes from press or other websites. Although my search was very thorough, inevitably I missed a few, and with a number of critics aggressively trawling the web to try to find anything Id missed, theyve managed to find a few.So Im now Im now going to address one of these to demonstrate in a similar style to my earlier investigation, an example of how a report which really tells us nothing at all has been misrepresented as eyewitness evidence for the official story. Case 2 deals with an outright fabrication, which appears to have been perpetrated since my article was published. The misrepresented case is one attributed to a firefighter named Alan Wallace. [[ Moments later, fire fighters Allan Wallace and Mark Skipper ran for cover as the ill-fated aircraft impacted the southwest face of the building, leaving hundreds of Pentagon workers as well as the 64 people aboard the plane dead or missing. "I just happened to look up and see the plane," said Wallace. "It was about 200 yards away, and was coming in low and fast. I told Mark that we needed to get the hell out of there." The hijacked Boeing 757, loaded with 30,000 pounds of fuel, departed Dulles International Airport at 8:10 a.m. enroute to Los Angeles. At some point during the flight, terrorists commandeered the plane and steered a course for Washington, D.C. At 9:40 a.m., the plane smashed into the five-story office building which serves as the nerve center of the U.S. military. One of these says that Wallace didnt actually make it under the van until after the blast. It also mentions that the plane was alleged to be about 25 ft of the ground. When it was 200 yards away? If it was a 757, the noise would have been deafening well before then. Its inconceivable that someone could only become become aware of a plane of that size at that height and distance by just happening to look up.. Notice that he says the plane, with no further embellishment. This statement might be plausible if it was something much quieter. So either it represents a dubious and poorly verified statement contradicting the official story, or else it simply isnt believable. In one of the other versions, he specifically states that he didnt hear it until he saw it. Theres a further problem with this statement. If was 25 ft high and 200 yards away, it would be at about a 2 degree angle from the ground where Wallace was standing, so it would be in his normal line of vision. He actually didnt need to look up at all. It should really be I just happened to be not looking down, and see the plane, which does not have a particularly credible ring to it. Other variations on this story do not have Wallace engaged in some kind of task, where hes looking down. Hes said to be simply walking along. Which means that the plane should have been in his field of vision, the moment it appeared over the horizon, rather than something which had to be looked up at to be seen. Its possible that the surrounding topography, trees and buildings limited the horizon to this distance and that Wallace did see it the moment it appeared, and has simply described the sighting clumsily, or not realised this, because it happened so quickly. So we shouldnt say That proves this guy is lying, but neither should we uncritically accept it all at face value without thinking it through. These are exactly the kinds of issues which would be raised in a cross examination in court. 400 mph is 195 yards per second. So if it was 200 yards away, then Wallace had 1 second to do everything which the article claims him to have done. 3) Turn and run about twenty feet. Ive tested this, using a tape measure and a metronome set at 60 beats per minute to count the time. When turning the instant of the metronome click (leaving no time at all for reaction and recognition, or yelling out), and beginning to sprint, I got to take one big step by the second click - covering about 7 ft, so I still needed another second to get close to 20 ft . ( and Im quick ). So its impossible to have done this in 1 second. You need at least two, which means that the plane must been 400 yards away, when he first saw it. Realistically, we should be adding another 1/2 to 1 second for reaction time and yelling out. So we really need to call the planes distance as 500 - 600 yards. You can try it out for yourself . A certain amount of latitude has to allowed in estimating distances, but expanding 200 to 500 or 600, is stretching the boundaries of such latitude. But if we reduce the vans distance to 15 ft, meaning that one more big step gets you nearly there, we might just be able to suggest that this is plausible in 2 seconds - 400 yards of flight, which just comes within acceptable margins of error. Apart from the fact that 500 -600 yards would be stretching the figures in the report beyond credibility, theres another reason why the plane cant have been more than about 450 yards away, unless we start changing another of Wallaces parameters by orders of magnitude. If it was 25 ft off the ground, and more than about 450 yards away, it would have crashed into the Navy annex, rather than coming over the top of it. Who says it came over the Navy annex? Several of the other witnesses which purport to support the official story. So either it didnt come over the Navy annex, discrediting those reports, or else Wallace is orders of magnitude out not only with the distance, but also with the height , and also significantly out with the distance of the van. This starts to create too much inaccuracy for the report to be credible, considering the confident and unequivocable manner in which the distances are presented, especially when combining it with the unlikely introduction of  just happening to look up. If it was anything like 25 ft off the ground, and went south of the Navy annex, then it probably would have demolished buildings on the other side of 395. If it went north, it might have hit the Sheraton, and if it went further north through the cemetery, it would have cut a vicious swathe of destruction through the trees. It might be possible to plot a credible flight path between these obstacles, but it would have to be very specific, and even if it avoided the major obstacles mentioned, one would think that a very specific swathe 500 - 600 yards long, of poles and trees, matching this path would have to been knocked over, easily discernible from aerial photos. No such obvious swathe exists.And you would then have to disregard all eyewitnesses that suggested a different flight path, Including Timmerman, Walter and Munsey, three often held up as proof of the official story. (Although they all contradict each other anyway, as well as Walter contradicting himself) But this complication is unnecessary if we reduce the distance of the van to 15 ft. If we assert that he underestimated the distance of the plane by 50% and overestimated the distance of the van by 30%, its unrealistic, but possible. 2 seconds gives a fraction of an instant to react, time to yell something, and time to get close to the 15ft sprint. The first step is the slowest because of the need to turn and push off and more ground can be covered in the following second. But there is a nagging problem. The report strongly implies that Wallace saw it first and alerted Skipper to it. If this is the case, we really have to add another 2 seconds, to do this and have both men take off. Did Skipper just happen to see it at exactly the same time? Is he also in the habit of walking with his head down? ( We are talking about delays of 1/4 second as being critical ) or did he see it a bit before Wallace, and Wallace didnt realize this? Maybe. Or perhaps they both saw it immediately it cleared the horizon. This isn't pushing me to allege with any confidence that this report is an outright fabrication, but at the same time, neither is it inspiring a lot of faith. Where in this account does Wallace give any indication as to what kind of plane it was? We dont expect him to say AA 757, but was it large or small, civilian or military? The reference to the alleged 757 was the creation of the writer, inserted into the middle of Wallaces story, giving the subconscious impression to the not fully critical reader that Wallace himself had described it as such. As was common in reports on this issue, the alleged witness simply said the plane, and the writer of the story added the assumption that it was a 757, in such a way that the careless reader could easily gain the general impression that the witness had actually said this. Any suggestion that Wallace told the writer that it was a large plane, and that the writer simply didnt quote him on this, is pure speculation. But even if we want to indulge in such speculation, the report then becomes difficult to take seriously, if we add extra time for Wallace to register something about what kind of plane it was. The scenario that Ive created to try to make the account plausible is postulating extraordinarily quick reaction times and giving the benefit of the doubt in relation to the added complication of whether both men saw it at the same instant. One has to factor in becoming aware of the danger, yelling out, and an instant smart decision to run straight for the van. Some people might just freeze in shock in this situation and not react at all within 2 seconds. Wallaces reported reactions are possible, but unusually sharp. In this situation, someone is unlikely to take in the added detail of the approximate size of the plane. Whether it was a small military jet or a large passenger jet, either would look big and menacing in that shocked instant of realization of what was happening. Were postulating an immediate turn and sprint, on registering the situation. Weve already twisted all the other dubious factors in this report to their limits, to try to keep it plausible.So the unsubstantiated assumption that Wallace told the writer it was a large passenger jet, but just wasnt quoted as such, forces us to add at least another hundred yards to the planes distance, which means thats its now back into the region where the 25 ft height starts to create further complications. The plausibility of the report can be best maintained by giving Wallace no time at all to take in anything about what kind of plane it was. The reference to the 757 is invention by the writer based on a preconceived conclusion. Im uncomfortable with how much Ive had to twist this report to try to keep it credible. I suspect that it may be a fabrication, or at least a wild embellishment. But its possible that someone named Allan Wallace might have experienced something like this. If so, all it tells us is what we already know - that something hit the Pentagon and caused an explosion. Any assertion that this represents an eyewitness account supporting the 757 theory is without justification, although a tentative case could be made to suggest that the noise factor might favour the small plane theory. Any web author who presents this account as evidence for the official story is either dishonest, or failing to critically think through the report and deconstruct it for real meaning. If you read my eyewitness article, youll see that the illusion that hundreds of people identified the pla ne has been to a large extent, created by the unjustified juxtaposition of predetermined conclusions onto reports that really dont tell us anything at all, like this one. Speculation to be argued back and forth, that a certain person may or may not have reported it as a large plane would be relevant if the physical evidence demonstrated that such a scenario was possible. It would be relevant in the event of a flyby rather than a crash. But in the case of the overwhelming physical, mathematical and scientific evidence that it was totally impossible, reports like this are worthless to the argument of what kind of plane or missile it was. In my previous article, I examined a number of reports which were exposed as outright fabrications. In the cases of Washington, McGraw and Timmerman, it was because internal contradictions exposed their reports as impossible to believe. In the case of Winslow, it was because an investigation into the media trail of how the report originated, indicated strongly that no such report was ever made, and that even if it was, it originated from third hand hearsay. In the case of Liebner, it was shown quite conclusively that Leibner never actually made the statement which you see in press reports and on websites, and in fact was never even interviewed. Since I wrote the article, another fabrication of a slightly different style has emerged, and Im going to deconstruct this one in order to demonstrate the desperate measures that have been used to try sell this outrageous story. In that split second, my brain flooded with adrenaline and I watched everything play out in ultra slow motion, I saw the plane coming in slow motion toward my car and then it banked in the slightest turn in front of me, toward the heliport. In the nano-second that the plane was directly over the cars in front of my car, the plane seemed to be not more than 80 feet off the ground and about 4-5 car lengths in front of me. It was far enough in front of me that I saw the end of the wing closest to me and the underside of the other wing as that other wing rocked slightly toward the ground. I remember recognizing it as an American Airlines plane -- I could see the windows and the color stripes. And I remember thinking that it was just like planes in which I had flown many times but at that point it never occurred to me that this might be a plane with passengers. In my adrenaline-filled state of mind, I was overcome by my visual senses. The day had started out beautiful and sunny and I had driven to work with my car's sunroof open. I believe that I may have also had one or more car windows open because the traffic wasn't moving anyway. At the second that I saw the plane, my visual senses took over completely and I did not hear or feel anything -- not the roar of the plane, or wind force, or impact sounds. and was probably in shock for much of that day. At some point I opted for quiet and turned off all the noise except the radio in my kitchen. Then I went to my car and faced that piece of the plane that was in the back seat. It appeared to be a piece of the tail. There was no metal on it and it was very lightweight -- all plastic and fiberglass. It was 22" long and 15" wide. I have no idea how it got into my car because I do not remember seeing any rubble flying around while I was at the crash site. I assume that it dropped in through the sunroof or flipped in through a window. The plane piece consisted of a layer of white paint, and layers of yellow and gray fiberglass as well as a thin brown corrugated material. Before pulling it apart, lets note that it's undated and unverified. It appears to have emerged about a year after the incident. Anybody can turn up a year later with a privately written statement and say whatever they like. So the verification standards are not acceptable. Lets begin with the entry of the plane into the building. This report clearly indicates that the plane flew into the building with wings close to parrellel and that both wings entered the building. I think I am on good scientific ground when I state that a solid 125 ft object cannot pass through another solid object without leaving a 125 ft hole. It doesnt matter how many eye witnesses might allege that they saw such a thing happen - it didnt. Anyone who alleges that they saw such a thing is either lying or deluded to the point of insanity - or else they saw a smaller plane, or a very sophisticated hologram or some kind of highly advanced, secret matter teleportation technology. If it was a plane small enough to fit into the hole, painted in AA colours, then the witness could be telling the truth.The witness doesnt actually say anything about the size of the plane, so its possible that she could have seen this, and not thought it through when later told that it was AA 77. Either way, this report is either a lie or a report of something much smaller than a 757, painted in AA colours. Lets apply some more critical thinking. This part. If she had a clear view of 100 yards out of each window, then she would have first seen the plane when it was about 100 yards from her car. If you check the location of Columbia Pike where said the plane was when she first saw it, and Washington Boulevard, which would appear to be the road that she was on, then it fits with such an assumption. It was allegedly coming straight towards her. The flying time from that point, to being directly over the road is about 1/2 second. The plane is a little over 50 yards long.It takes about 1/4 second to fly its own length. It allegedly discernibly changed its direction in the time that it took to fly twice its own length -from one quarter second increment to the next - from one plane length to the next. Even if thats physically possible, the human eye could not pick this up. Ive checked this speed on the metronome. If you say the words too fast at a quick pace, its approximately the time of of the word too. To suggest that any change in direction could be detected in this time would be to assert that the plane jumped like a film thats had some frames cut out. Not possible. She says that she went into slow motion mode. This can happen, when a person is presented with a threatening situation at high speed, but there are limits. As we shall see, this report well and truly exceeds those limits. Like this. This indicates that the plane sliced through the building quite easily. If its initial speed was 400 mph, then 300 mph seems a reasonable estimate of its passage through the wall. At 440 ft per second., the whole plane would have taken 350 milliseconds to pass through. Analyze the smoke ring cycles in the first half of the penetration. There were two complete smoke rings in the time of about 1/2 the penetration of the plane which is about 175 ms. 87 ms per smoke ring cycle. Each cycle was divided into 3 distinctly visible stages. The appearance of the smoke at the top of the fuselage, the coiling around to cross over at the bottom, and the coiling back up to cross again at the top. About 29 ms per section. This is roughly equivalent to 1 video or film frame. Video or film runs at speeds between 24 and 30 frames per second, depending upon the format. About 30 to 40 ms per frame. The whole idea of this speed is that the human eye cant distinguish between one frame and the next, making the motion appear continuous and seamless. Except for Penny Elgas, who has the miraculous ability to distinguish one frame from another. Watching videos must be a real drag for her, because she can see all the little tricks they do with stunt work and other cutting techniques. On the brighter side, shell never be short of a job as a referee or lineswoman for the international tennis circuit. They should be lining up at her door after this report. Then another three part series. The wings, the explosion, the tail. About 27 ms - 1 frame each. I dont care how much someone is in slow motion mode - the human eye and brain in combination simply cannot register distinctly different images and event sequences at this pace. In all, 10 distinct events have been described. 3 sections of smoke ring times 2, the beginning of the fire, the entry of the wings, the explosion, the entry of the tail. An average of 35 ms per image - 10 distinct images in 10 frames Again, using the too fast comparison, the entire entry of the plane would take about as much time as the word fast. As another comparison, try repeatedly clapping your hands as fast as you can from a distance of about 2 ft between the hands, and see how blurred the movement is. Each clap is about the total time that the plane took to enter the building - and you only get one shot at seeing it. Now imagine registering 10 clear separate images, in smooth sequence within each blurred handclap, registering details such as the thickness of the smoke, and the crossover of the rings. People in dangerous situations can get adrenalin bursts which can trigger extraordinary feats of strength. When someone whos experienced this situation says that they lifted the side of an overturned car to free their trapped partner, we are inclined to believe it. But if they say that they jumped over a 100 ft fence with the adrenalin burst, we know that they have crossed the line.This account is the visual equivalent of that 100 ft fence jump. Its physiologically impossible. She says that after the explosion, the tail continued to slipinto the building. Hold on a moment - this is the explosion which is disintegrating the plane to nothing - blowing outwards in all directions, but the tail is continuing to slip serenely into it at the same time as being being cremated by it? Even Hollywood doesnt bother with this illusion in explosion scenes, because they know its the exact opposite of what happens. When something is travelling forward into a blast, it gets pushed backwards by the force. Of course, if it has strong momentum, the two will counteract each other. But it doesnt just keep travelling at the same speed into the point of the blast, at the same time as being vapourized by it, like being fed into a furnace on a conveyer belt. It wouldnt matter how many eyewitnesses claimed to see this happen - it didnt. At the same time that the tail slipped serenely into this all consuming blast, without missing a beat, a fragment of it was blown 100 yards back the other way, to land in her car. Penny really should be relating this story at physics conferences around the world. Im sure theyll be busy rewriting the rules of how the universe works after verifying this. Now the claim that she was able to see the windows and colour stripes on the plane. In total she probably saw the plane for about 1 second. Imagine yourself stopped at an intersection, and a car goes past at 150 mph. You are able to report to the police that you recognized the distinctive gold, green,and black door trim of a mid 80s Falcon,and noticed that the windows were tinted. Now multiply the speed by 2.5. Thats only some of the problem. Elgas says that at the time of initial sighting, the plane was headed straight towards her. She cant have got a good view of the stripes and windows from front on, in the first 1/4 second. Then it was banking away a little and was directly over the road, with the near wing banked up a little, so that she was looking up at the underside of the wing. What could she see ? Go back to those photos of 757s and have a look at the way theyre built. The wing at the point where it joins the fuselage is just on the lower stripe, and would obscure a very significant section of the stripes and windows from this angle.The engine juts out significantly forward of the wing. Very little of the fuselage would be visible from this angle, during this 1/4 second window of opportunity. As the wing extends out further, it gets narrower,but the closer perspective increases its effective width in her vision. Im not saying that the all of the stripes and windows were completely obscured for the whole sighting, but there would be a ridiculously short window of opportunity to catch any glimpse, as the plane turned from its front on view, to its wing obscured view. Then it would have been past her, with the 15 ft tail fin , the closest part of the plane, banked slightly, to show her the underside, and obscuring a significant amount of any parting glimpse she might have got.The phones will be running hot from the tennis association!! 4-5 car lengths can be approximated to about 60 ft. The length of the wing to the fuselage is 56 ft, making a total of 116 ft from driver to fuselage.Subtract a little, as the plane is alleged to be slightly banked, thus reducing the effective horizontal width. Offset this for the length of her cars bonnet. Lets call the 4-5 car lengths can be approximated to about 60 ft. The length of the wing to the fuselage is 56 ft, making a total of 116 ft from driver to fuselage.Subtract a little, as the plane is alleged to be slightly banked, thus reducing the effective horizontal width. Offset this for the length of her cars bonnet. Lets call the total distance from drivers eyes to fuselage 118 ft. To make the maths easy, round it to 120. Sitting in the car, her eyes are about 4 ft off the ground, so the effective height of the plane from her eyeline is about 76 ft. Round this to 80. If you check the angle made by something which is 80 ft high and 120 ft distant, its approximately 30 degrees. When I sit in my car, a 30 degree angle from my eyes looks straight into the folded up sun visor. In other words, you cant see something at this angle from a car. Of course, its a little different for each person, depending on their car, seat position and posture Her distances, as in the case of Wallace are subject to inaccuracy, but the point needs to be made that on the basis of these figures it would be impossible for her to see the fuselage, from that height and distance. The open sun roof wouldnt help. The fuselage would be behind the section that joins the windscreen to the roof edge. Of course, with a moment to spare, one can change this by leaning forward, but its been established that she probably has about 1/4 of a second to sight the small section of the windows and AA colour scheme that isn't obscured by the wing. Because of the many variables, we cant state with certainty that the fuselage was hidden from her vision, but when taken at face value, it appears to be impossible for her to have seen it. And now, the encore. The piece of plane that found its way into her back seat. If youve checked the link, you will have seen the photo of it, and will unreservedly agree that it is definitely, without doubt, unequivocably a piece of - ??? - a piece of whatever they tell us it is. Its turned up at the Smithsonian museum, in a little patriotic box, which apparently proves that it must have once been part of a 757. And we know that it was found in Pennys back seat. We have absolute proof of that because she told us so. Penny - as one of the few people on Earth who has actually witnessed a 125 ft solid object move through another solid object without leaving a 125 ft hole - and also with the help of some adrenalin, has performed the visual equivalent of jumping over a 100 ft fence, is not a person whos word can be doubted. So this piece of the plane which had just been flung 100 yards out of a violent explosion, with temperatures orders of magnitude above 700 degrees C, just a few seconds before, lobbed into Pennys back seat, 1 to 2 feet behind her head, so gently and quietly that she didnt even notice it - which is strange for a person who was in a state of mind that enabled her take in tiny details in 30 ms increments. Furthermore, the piece of plane had miraculously cooled down during its 100 yard journey, to the extent that nothing caught fire, or even singed, or made a burning smell in the back seat. It just sat there quietly like a good little piece of plane should, until she was ready to find it and put it in the little patriotic box. It is physically impossible for all of the plane to have entered the crash site, and this is backed by solid mathematical proof. There is no evidence outside the building of wreckage to account for the part of the plane which cannot have entered the crash site. There is no evidence of identifiable wreckage inside the crash site. Cremation of the plane was unprecedented in aviation history and physically impossible. Even could such cremation have been possible, it is impossible in the context of the modest damage to the wall. The hole in the back of the third ring cannot be explained by any means other than a missile. Fake wreckage has been designed and planted with the express purpose of impersonating the American Airlines colour scheme. Eyewitness evidence is inconclusive and fabricated eyewitness reports have been presented to try to shore up the official story. Claims that DNA testing identified 63 of the 64 people on board, are mutually exclusive with claims that the plane was cremated, and with the official line on the WTC victims and the Bali bomb victims. So if it didnt hit the Pentagon, what happened to AA 77 and the passengers? An important question, but its irrelevant to the argument of whether it hit the Pentagon. By way of analogy, imagine a murder prosecution where the defence has presented an overwhelmingly strong case - more than just reasonable doubt - solid proof that the accused cannot possibly have committed the crime. But then the prosecution plays its trump card.  But if your client did not commit the crime, then who did?  The defence answers that it has no idea. Everyone would agree that a guilty verdict on this basis, would be an outrageous lapse of logic. Yet this is precisely the same lapse of logic as suggesting that a lack of alternative explanation for what happened to the plane and the passengers is in any way relevant to the question of whether it hit the Pentagon. The government knows what happened. Investigators have to work it out bit by bit. The full truth will emerge in time, if a methodical, rational, step by step approach is persevered with. I can see one good reason to cling to the belief that AA 77 hit the pentagon. The unshakable faith that the govt would not - could not lie to us. A faith so strong that the laws that laws of physics and motion suspend themselves in order to maintain it. A faith so strong that even the government admitting that it lies cannot overturn it. This statement from Solicitor General Olsen.